Kittens too young to eat on their own or too young for adoption are one of the largest groups of animals euthanized every year in animal shelters across the United States. This does not have to be the case. The National Kitten Coalition is a 501(c)(3) nonprofit organization dedicated to increasing survival rates of rescued kittens. We achieve our mission by educating and training animal shelter staff, rescue groups, volunteers and fosters to provide high-quality, cost-effective care; providing outreach and educational materials to animal welfare professionals and the public; and promoting cooperation and information sharing within the animal welfare community. While the Coalition itself does not provide direct animal care, many of our staff and volunteers foster for shelters and rescue groups. 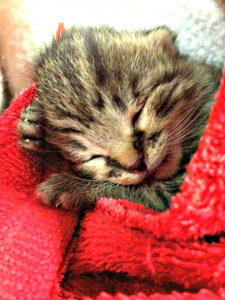 If you have a kitten who needs care, please contact your local animal shelter, rescue organization or veterinarian.